Google are bastards – money grabbing bastards. Set up your Google Ads. Tick a box to say ‘Exclude visibility from people in the education sector’. Let you get the clicks you want and not wasted clicks from students etc. who are NEVER going to buy what you have to offer. But they won’t do that – they make too much money from those clicks. The most they will do, in a very limited way, is to allow you to use IP exclusions (which we’ll come onto further down). In short (as is covered on the page Google Ads IP Address Exclusions Limit), Google has many different ways in which they COULD avoid you wasting budget on clicks from within the education sector. Those types of insights come from A1WebStats. However, A1WebStats can also be used to identify visitors from the education sector. If you are an A1WebStats customer, it’s easy to set up a filter that shows you visitors from the education sector, including those who used your Google Ads budget to click through to your website. Just contact us and we’ll show you how. If you’re not an A1WebStats customer, you can have a free 30 day trial so that you can identify clicks from the education sector. For some businesses, the impact won’t be large. If you identify a small percentage of your Google Ads clicks as coming from within the education sector, then you’re probably not going to be too bothered about the wastage. It’s when the numbers get higher that there’s a bigger impact. A business spends £100 to get 100 clicks to the website (based on an average of £1 per click). 5 of those clicks were from the education sector. Although that’s only 5, it’s still a wastage of £5. So, for every £100 spent, £5 is being wasted. Multiply that up by chunks of £100 spends on Google Ads and then you can work out the full wastage amount over a period of time. Each time someone in the education sector clicks on your Google Ads, it reduces your budget available for the rest of that day. Then, when a potential customer searches in Google, they may not see your advert. Why won’t they see your advert? Because the person from within the education sector has clicked on your advert, which means that Google has to spread your daily budget over the rest of the day, and so may decide not to make your advert visible at that time. Outcome: each education sector visitor click costs you lack of visibility to people who you DO want to see your advert and click. Need help with identifying wasted clicks? Contact us – it costs you nothing for us to show you how to identify whether or not you have a problem with wasted Google ads clicks from people within the education sector. Google will allow you to exclude visibility of your Google Ads by inputting IP addresses into your campaigns as ‘exclusions’. That sounds great until you find that they only allow you to exclude up to 500 entries. What’s worse than that is that people (who, to be honest, wouldn’t know any better), input an IP address they’ve seen in their A1WebStats data, and think that’ll solve the problem. That shows a Google Ads click from someone within Canterbury Christ Church University. The A1WebStats system allows you to look at an IP tab to pick up the IP address. There you can see the IP address is 194.82.210.247. It would be a mistake to use that IP address as one of your Google Ads IP Exclusion quota of 500 allowed. 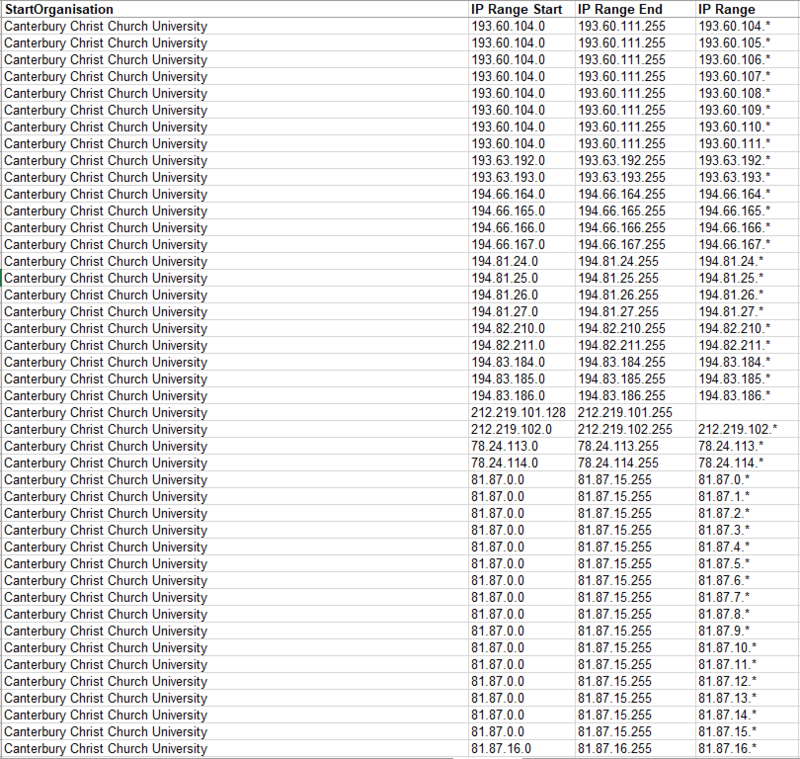 This is because that’s just one person from Canterbury Christ Church University, on one IP address. Another person could come back from the same university, from a different IP address, and would see (and click on) your advert. So by inputting just one IP address as an IP exclusion you achieve nothing!! Included in that view above is an IP range 194.82.210.0 to 194.82.210.255, which includes that visitor from 194.82.210.247. To add that IP range as an IP Exclusion in Google Ads you would use 194.82.210. * to include all those IP addresses as being blocked. That would use up only one row of the 500 rows Google allows you, but it would achieve the blocking of ALL the IP addresses within that range. However, that would account for only one IP range within Canterbury Christ Church University and so if you wanted to block ALL people from there from seeing your Google Ads (to avoid click budget wastage), then you would need to use 179 of your total 500 IP address exclusions within Google Ads (which would block a total of 13,439 IP addresses from within that university from seeing your Google Ads). Google (wrongly!) only allows you up to 500 rows of IP addresses that you want to block from seeing your Google Ads. Having first of all given IP exclusion priority to internal traffic and competitors/suppliers, you should then have the majority of your 500 IP address exclusions to then allocate most efficiently. The problem is that those within the education sector (particularly universities) have huge ranges of IP addresses. In an ideal world, Google would let you block larger ranges to squeeze more out of the 500 rows limitation. As an example, the view below shows that University of Warwick has four individual IP ranges (which would take 4 rows of your 500 allowance), but it also has a much bigger range of 137.205. *, which would potentially allow you to block a huge range of IP addresses from within that university from seeing your adverts. If you try it, it tells you that you’re not allowed. But if you did that, you’d eat up over half (260) of your total 500 IP exclusions allowance on just one university. You have this restriction of only 500 IP ranges that you can block from seeing your Google Ads. In the education sector alone there are hundreds of thousands of IP ranges. We know – we have all that data in our database. But ALL that data is no value to you (although we do sell that data to interested parties) – you need to be selective about WHICH IP address ranges to include in your paltry 500 allowance. As things currently stand, if you’re not utilising your allowance of 500 IP ranges you can exclude, then you really should be putting SOMETHING in there to cut down Google Ads clicks wastage! Most of your clicks wastage is likely to come from universities or colleges. Although some may come from schools, allocating IP exclusions to universities or colleges will avoid more Google Ads clicks wastage than if allocating to schools. If you don’t use A1WebStats or don’t know how to extract education sector visitors, or even aren’t sure which education sector IP ranges you should be blocking from Google Ads visibility, then just contact us for free help. You can download our spreadsheet that allows you to filter by geographical areas within the country. The outcome will be a view of how many IP address ranges we can supply, within universities or colleges of interest to you. 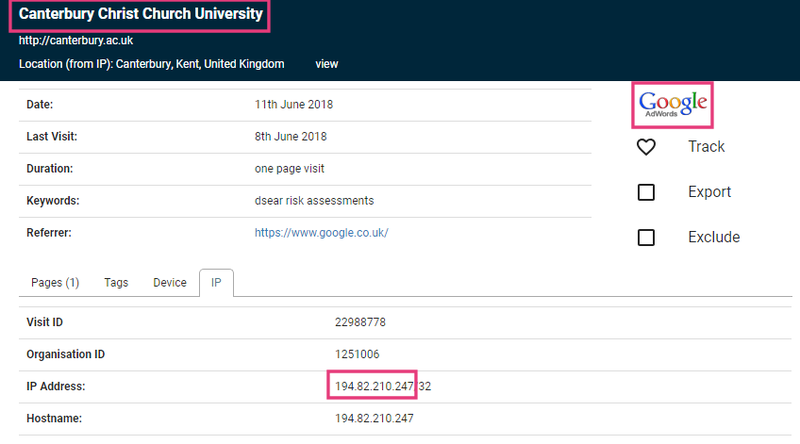 In the example above, if you chose Canterbury Christ Church University, University of Kent, and Kent College, you’d use 489 rows of your 500 Google allowance and would block Google Ads visibility to a total of 79,794 IP addresses from those three education sector organisations. 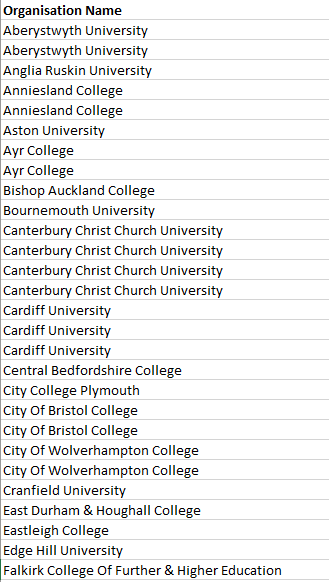 Within the spreadsheet, you won’t see the actual IP addresses in the ranges, but will get a view of how many there are within each university/college in your geographical area, and therefore how many rows it would use of your 500 IP exclusions allowance. If you would like the IP ranges (so that you can then copy/paste into your Google Ads IP exclusions), then you can find out how to buy them cost-effectively further down this page. If your Google Ads are nationally visible then you have some tough choices to make. If you use A1WebStats then you could extract data showing you all the education sector visitors over a certain time period. Exporting that to Excel would show you some university or college visitors that are consistently visiting your website, including via Google Ads clicks, which may help you to decide on which are the most important. Your starting point is to download our spreadsheet that allows you to view alphabetically, or filter by geographical areas within the country (there may be particular areas more likely to click on your Google Ads). The outcome will be ranges of IP addresses within universities or colleges. Some will be more beneficial to buy/include than others. The challenge is in choosing which ones to exclude. This video shows you how to filter the spreadsheet and then choose the IP ranges of most value for you to add as IP exclusions. If you haven’t already done so, you should use the A1WebStats system (we’re here to help you with this, whether or not you are a current customer) to identify visits from the Education sector that you definitely don’t want wasting your Google Ads budget. That business pays on average 65p per click. Those above were 28 clicks out of a total 126 within two weeks. 126 clicks at an average of 65p per click works out at just under £82 of wasted clicks from within the education sector. Multiplied up, that would be £2,132 of wasted Google Ads budget in a year. Look at your education sector visitors that arrive via Google Ads and decide that it’s not actually a huge problem/cost/wastage. 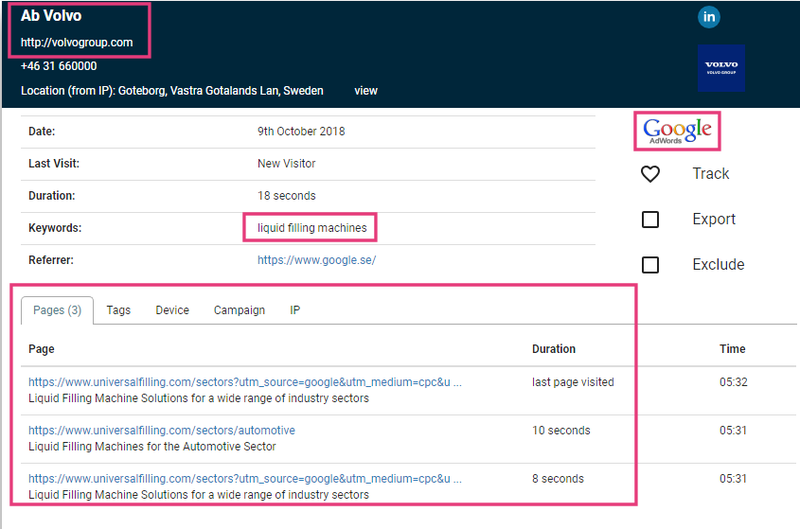 Look at your education sector visitors that arrive via Google Ads and choose to utilise the 500 IP range exclusions that Google will allow, to reduce some of the wastage. With option 2 you won’t (unfortunately) be able to avoid all wastage – simply because you only have 500 IP exclusions to play with. But you’ll be eliminating up to 128,000 IP addresses (if using all 500 rows) from ever seeing your Google Ads. The cost of doing that? We supply that data for £10 per education sector organisation chosen (with a minimum purchase of 10 organisations chosen). Each organisation chosen will contain many rows of IP ranges, all of which are included in the cost of £10 per organisation. For most people, 10 organisations will supply more than enough IP ranges to fill up your 500 rows of IP exclusions allowance in Google Ads. So, if you identified 10 education sector organisations that you don’t want to get clicks from, that would cost a one-off cost of £100. That £100 would be recouped by avoiding visibility/clicks from those organisations. That £100 will go on benefiting you for many years ahead (because education sector IP ranges very rarely change). The bonus is that by avoiding clicks from those education sector organisations, you will get more clicks from people that you DO want seeing/clicking on your Google Ads. Avoiding many education sector clicks is ultimately going to cost you nothing at all. In fact, it will soon be profitable. OK, that’s a bit misleading: it’s going to cost you something (£100 for most people, who choose 10 organisations from within the education sector), but you’ll recoup that cost easily because you won’t be wasting budget on clicks from thousands of education sector IP addresses that you don’t want to be getting clicks from. You download our spreadsheet containing our database of universities and colleges to identify those you are interested in blocking from seeing your Google Ads. Each university or college has a cost of £10 each and each will have numerous IP ranges that can be inserted in as IP exclusions within your Google Ads campaigns. Filter the spreadsheet and choose at least 10 that you want IP address range information about. All you have to do is enter ‘Y’ within the ‘Buy’ column (H) next to the education sector organisations that you want. Email those back to us via hello@a1webstats.com, with a subject line of: IP address ranges request. You are not committed to buy at this stage. We confirm the price (based on £10 per organisation) and arrange payment with you if you would like to continue. We email you the full IP ranges, alongside the educational establishments of interest to exclude. Those are ready to copy/paste directly into your Google Ads IP exclusions. You hugely reduce wasted clicks. Your Google ads budget goes further and your visibility in front of potential buyers increases. Still not sure how it all works? We will email you up to 10 of the IP address ranges for that organisation, and details of how to copy/paste them into your Google Ads IP exclusions. *This is limited to one per organisation and samples will only be sent to people who supply email addresses that show their website domain. We will not supply samples to generic (e.g. gmail) email addresses. It costs you nothing to download our spreadsheet and filter to see the ranges of IP addresses that we have covering universities and colleges. You may still have questions though so please do contact us and we’ll be happy to help.